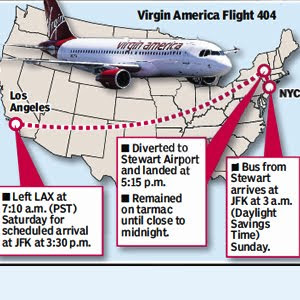 Last Saturday on March 13, 2010, Virgin America flight 404, a flight from LAX airport in Los Angeles to JFK airport in New York, left California just after seven in morning for a scheduled five hour flight. Unfortunately for the passengers and crew, the airplane was diverted to Newburgh, NY, where the aircraft was stuck on tarmac for at least four hours. Eventually, the passengers were taken by bus to JFK, arriving about 12 hours behind schedule. Many of the media reports about this event are focusing on the human behavior aspects of the story, including tales of passenger misbehavior, fight attendants rationing potato chips and cookies, the screaming babies, and a social networking site CEO creating online videos and live Twitter posts. No airliner incident involving a flight from LAX would be complete without a Hollywood connection. One of the passengers was Carrie Ann Inaba, a judge on the "Dancing with the Stars" television show, who you may remember from her (un? )forgettable role as Fook Yu in the movie Austin Powers in Goldmember (not to be confused with the character Fook Mi, played by the equally memorable Diane Mizota). In the last few years, tarmac delays became a very visible issue in the media and with numerous members of the US Congress in response to a series of incidents in which passengers were stranded on the ground aboard aircraft for lengthy periods. The US Department of Transportation (DOT) proposed a rule change in November 2008 that requires airlines to provide adequate food and water within two hours of a tarmac delay, and to keep lavatories in operation. This change in tarmac delay regulations was adopted in December 2009. Another change was that the DOT now provides detailed information on flights with delays of three hours or more. One of the most reliable sources of information for US airline data and statistics is the DOT's Bureau of Transportation Statistics (BTS). Their reports provide information on departure delays that includes details on individual flights that were delayed three hours or more, as well as summaries of departure delays by airline and by airport. According to the Bureau of Transportation Statistics, there were 902 flights with tarmac delays of three hours or more in 2009. Some of these flights were delayed even longer, with 137 flights delayed four hours or more. Contact your family to update them on your situation. If you have a Internet capable device, update your Twitter account, Facebook page, or any other kind of social media that you have. If you have the capability to document your delay with photos or videos, do so during the event, and when you have a chance add it to a service like Flickr or YouTube. Contact local news media and encourage them to cover the event. The delay data provided by the DOT is quite valuable in that it provides a statistical summary, but it doesn't provide the kind of personal perspective that a passenger can. If you have been on a plane in one of these extreme delay situations, we'd like to do our part and publish your story. Please visit the AirSafe.com Online Complaint Form and share your experience, even if it did not involve an airliner flight in the US. We'd like to post one or more of these stories on FlightsGoneBad.com.